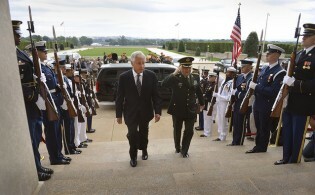 U.S. Secretary of Defence Chuck Hagel welcomed Chinese Defence Minister Chang Wanquan to the Pentagon Monday as part of Chang’s four-day tour of U.S. defence compounds. A nuclear-armed Iran would not pose a fundamental threat to the United States and its regional allies like Israel and the Gulf Arab monarchies, according to a new report released here Friday by the Rand Corporation. In the late 19th century, Russian playwright Anton Chekhov famously touted one golden rule for dramatic productions: if you show your audience a loaded gun in the first act, that gun must go off by the last. Tuesday’s nuclear test by North Korea poses major new questions about the sustainability of President Barack Obama’s first-term policy of “strategic patience” in dealing with Pyongyang. Not many nice things can be said about the apartheid regime in South Africa. It was racist, violent in the brutal oppression of many of its own citizens, and was despised around the world.